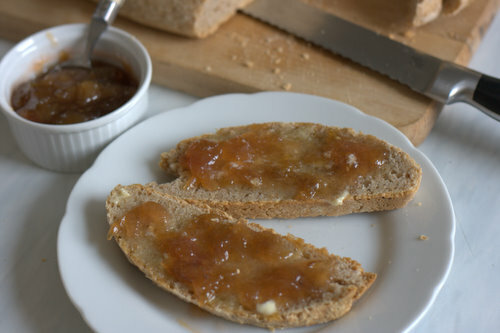 What is nicer than homemade bread topped with homemade jam for breakfast? This is a jam with an Asian twist, with hint of chilli and ginger. Certainly different, but not too startling for first thing in the morning. This jam is based on a recipe from Jamie Oliver’s Fifteen, which I visited a few months ago, when we had the most amazing bright pink rhubarb and ginger jam. 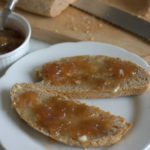 Becca asked for the recipe, and made some more jam which she blogged. I based my jam on recipe Becca used, but played with the flavours, using Thai ginger, or galangal, and adding some chilli. My jam is sadly not as pink as the original, my rhubarb was long past the first flush of youth, but is still delicious. Taste the syrup before cooking to test the chilli levels. This recipe is very easy to scale up or down, with equal weights of rhubarb and sugar, 1 chilli per 150g fruit. After the jam is cooked allow to cool for a few minutes and always pour into hot jars. Boiling hot jam being poured into cold jars may cause the inside of the jar to expand faster than the outside, which can make the jar crack or shatter. If you try this Thai Ginger, Rhubarb & Chilli Jam please tag #FussFreeFlavours on Instagram or Twitter. It is amazing for me when for me when you make one of my recipes and I really do love to see them. You can also share it on my Facebook page. Please pin this recipe to Pinterest too! Thanks for reading Fuss Free Flavours! After a day the sugar will draw the juice out of the rhubarb making a lovely pink tinged syrup. Taste to check the level of chilli, if hot enough, remove them, if not leave them in for the cooking. Place the rhubarb, syrup, ginger & lemon in a saucepan and gently simmer until setting point is reached. Taste the jam whilst cooking and add more ginger, or remove the chillies, if desired. Remove the chillies (if you have not already done so), pour into clean warm sterilised jars and seal. Setting Point - Place a blob of the jam onto a saucer and allow to cook for a minute, if a skin forms and the jam wrinkles with a gentle poke the jam is ready. If still runny carry on cooking. To Sterilise Jam Jars - Remove the lids and place in a low oven for 20 minutes, pour boiling water over the lids, or run through the dishwasher.